Costco Review - Can you save money? America’s favorite wholesale store used to have a good reputation for their jewelry. However the standard seems to have fallen if other reviews are anything to go by. We decided to check this out for ourselves and see how Costco holds up against the big players in the online diamond market. These are the only benefits we could find from buying your jewelry and you will find some shocking revelations further on in this review. Nor being a name that instantly conjures up images of dazzling diamonds we expected Costco stones to be more bargain basement than bespoke. The biggest surprise came when we compared their engagement rings to leading names and discovered how poorly they fared price wise. As they don’t sell loose diamonds we had to compare a preset ring with one you design yourself from two other retailers. 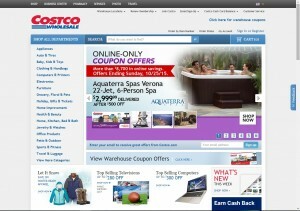 There is no ‘design your own’ feature on Costco. 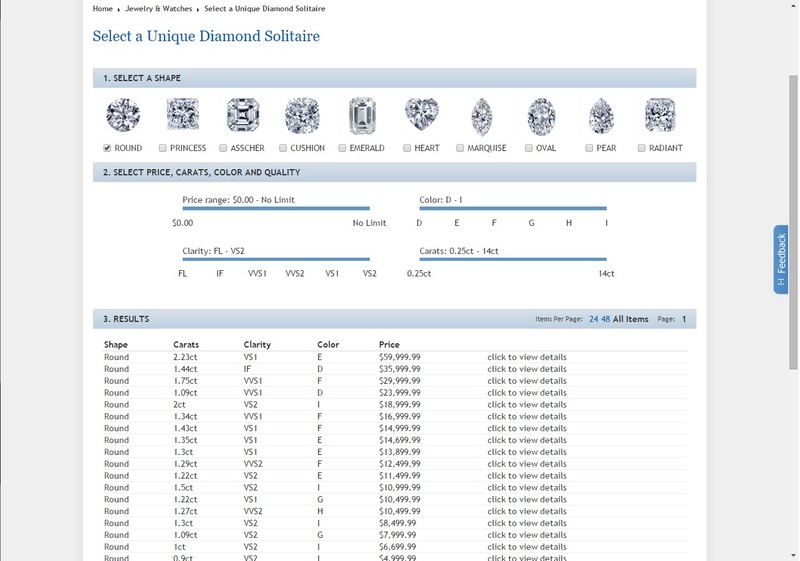 The best you get is clicking on “select a unique diamond solitaire” from the left hand menu. We chose a round 0.9ct, VS2, color l stone. There is not cut options they are all classed as ‘brilliant’. As there is no accreditation with this stone we can only take their word for the brilliance of it. 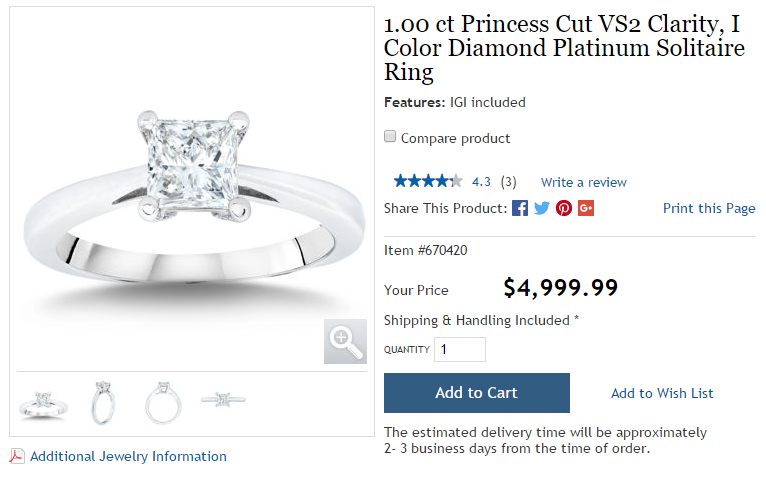 When you click on view it transforms into a very attractive platinum engagement ring costing $4,999. On the James Allen site we chose a platinum setting which cost $825 then a like for like stone of 0.91ct with an excellent cut for $3,640. 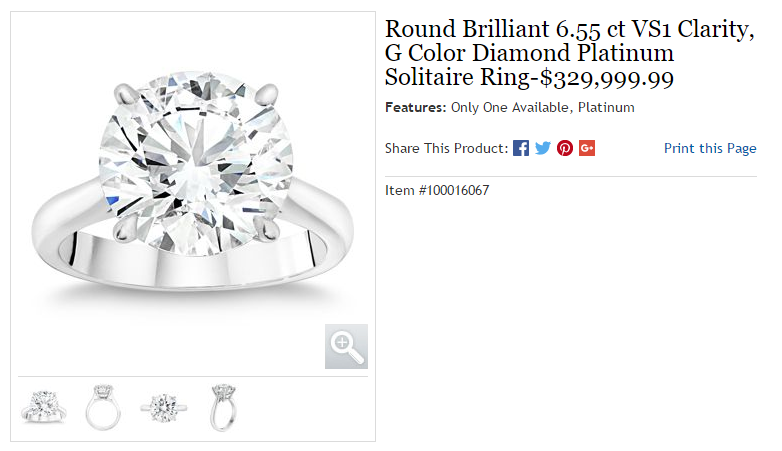 This made a total of $4465 for a ring from a leading retailer with a stone accredited by AGI or GIA. Buying this ring, complete with un-certified stone, will cost you $534 more at Costco. This result intrigued us and we wanted to make sure it wasn’t a one off. This time we headed to one of our favorite sites; Whiteflash. 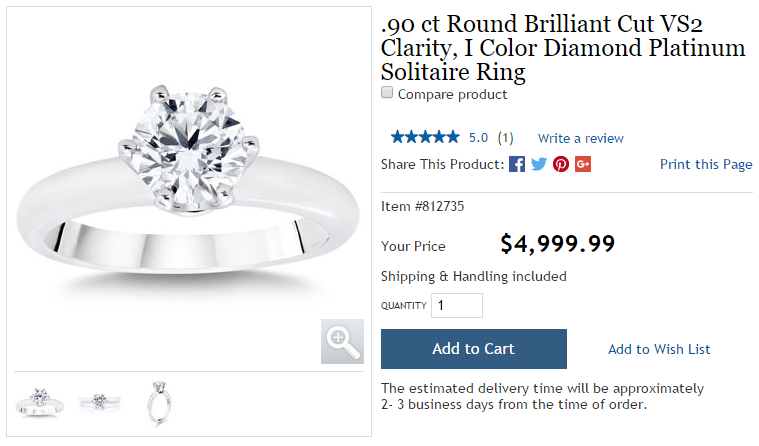 They have an outstanding reputation in the world of online diamond retailing and we couldn’t wait to see how Costco’s price point compared to theirs. Starting with Costco we went for a princess 1.00 ct, VS2 clarity, color l diamond which became a 4 prong platinum solitaire again costing $4,999.99. On Whiteflash we started with a classic platinum solitaire setting costing $695. To this we added a like for like stone of 1.016 ct from their A CUT ABOVE range which was GIA certified. The diamond cost $4,272 bringing the total cost of the ring to $4967 or $4818 if you pay by wire transfer. These savings of $32.99 or $189.99 don’t seem a lot but when the saving is in the favor of a company of Whiteflash’ caliber it’s massive. For a store that isn’t dedicated to diamond retail this should be the other way around. If you are looking for a very high quality ideal cut diamond then take a lot at Whiteflash’s A Cut Above Diamonds, for good value I would look at either Blue Nile or James Allen over Costco. You don’t need me to tell you about Costco as their reputation precedes them. Buy in bulk and pass on the savings with razor thin profit margins is their famous business model. With stores across the length and breadth of the US, and a strong online presence, they are a force to be reckoned with in terms of discount shopping. Their jewelry side, however, is seriously lacking both online and in store. Go to the jewelry department in any of their stores and you will discover that the guy in charge of the jewelry section is also in charge of the TV’s. This leads to a serious lack of knowledge and expertise in this area. The Costco story began back in 1976 when Robert and Sol Price raised $2.5m from their family and friends to open the Price Club. This was the USA’s first warehouse club store and was only for business shoppers. The store opened in a remodeled airplane hangar in San Diego and in the first year recorded a loss of $750,000. This was merely a blip however as by 1979 they had 2 stores, employed 900 staff, had 200,000 members and were in profit by $1m. The first Costco Warehouse opened its doors in 1983 in Seattle and was the brainchild of Jim Sinegal and Jeffrey H. Brotman. Sinegal was an ex-employee of Price Club and wanted to create a warehouse business that was open to everyone and not restricted to trade customers. Costco and Price Club worked alongside each other until they merged in 1993 and were re-branded as PriceCostco. The brand went universal allowing members of one to shop at the other and vice versa. Robert and Sol Price left the company in 1994 and in 2007 the company underwent another name change to become Costco Wholesale Corporation. All of the remaining locations bearing the Price Club name were renamed Costco. In 2015 the company is a truly global enterprise with their warehouses being as widespread as the UK and Australia. In the 2014 Fortune 500 they rank 19th an continue to be the warehouse retailer of choice for millions of Americans. Despite being an off the shelf retailer with no designer items as such the Costco jewelry department does have an exclusive, one of a kind section. One of these is an eye clean round, brilliant 6.55ct VS1, G Color platinum solitaire ring which retails for an eye watering $329,999.99. Thankfully, at the bottom of the page you can click on links to both an IGI certificate and GIA report. This is undoubtedly a stunning ring and claims to be a one off with an IGI value appraisal of $536,255. Even then I would still do some comparisons before spending this much money on a ring. The quality of the diamonds Costco sell is questionable considering most of them come with no accreditation whatsoever. You would expect them to at least have been certified by IGI but all you get when you purchase a diamond ring under a certain carat from Costco is their own appraisal for insurance purposes. It is widely recommended that you have the stone appraised by an expert as several reviewers have reported that they did not receive the quality of stone they ordered. In my humble opinion, if a diamond does not come with any kind of certification steer clear. Especially when you consider the comparisons above which indicate you are paying well over the odds for un-certified stones. We struggled to discover what the criteria was on which the accreditation you received was based. Buried in the FAQ section it states that it depends on the carat, or size, of the diamond. More than 1.25ct comes with a diamond grading report from AGS and an appraisal certificate from IGI. Their one of kind pieces come with both regardless of carat. 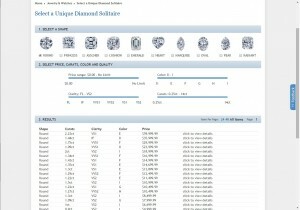 As IGI are not one of the better gem labs and do not have the same high standards as GIA, for example, these certificates are not worth as much. However, they are still better than the stone just being inspected by an in-house graduate gemologist as is the case with the smaller stones. Sorry, but this just isn’t good enough. Go to a retailer such as Whiteflash or James Allen and even their smallest stones come with certificates from AGS or GIA. As even a stone of 0.9ct carries a price tag of several thousand dollars you are entitled to know the true quality of the stone you are buying. There is no website dedicated to Jewelry at Costco. It’s a case of heading to their main site and clicking on Jewelry and Watches in the left hand menu. This obviously limits the choice on offer as it is merely a branch of the mighty Costco oak. That said, the layout is way better than other departments so they have clearly made an effort to display their jewelry in a visually appealing manner. The left hand menu contains all the options you need and is extremely easy to navigate. There is no option for creating your own engagement ring on this site. And while you can choose your own diamond however but have no say in the setting. No loose diamonds are sold by Costco either so for those who want a preset ring off the shelf to speak this site does the job. They do have a nice selection of engagement rings but be warned that if you click on Engagement Rings Collections the shop by price doesn’t work you have to use the names of the collection on the left hand side to view any rings. In the main engagement ring section we chose a ring costing $7,499.99. There was no 360° imagery merely the option to zoom in and view it from 3 different angles. The checkout process was quick and easy but those who are not members of Costco will have to register before completing the transaction. I cannot fault the image in the jewelry section of the Costco website which is of an extremely high standard. The rings positively twinkle on the screen and make you want to investigate them further. However, as there is such a small selection compared to dedicated diamond websites it would be nice if ‘on hand’ images could be added as well. A very enjoyable shopping experience on the whole. I enjoyed perusing the images of the rings on offer and couldn’t fault the check out. Costco are renowned for their customer service so this came as no great surprise to be honest. Along with the imagery this area scored very highly with this reviewer as I really have no complaints. Under each item there is a description of the piece you have chosen and that’s it really. I Googled Costco Diamond Buying Guide but the link didn’t exist anymore. This is a shame as although the info beneath the rings is pretty good if you don’t know what a slight visual inclusion is there is no point of reference. There is an ‘Additional Jewelry Information’ link beneath each product which opens a PDF but this is an FAQ guide. It states on here than all diamonds sold by Costco are of VS2 clarity or better and the color is always l or better. Information on the 4 C’s are way down at the bottom of this FAQ section and I personally believe that this should be easily accessible from the jewelry home page as this is vital information for those customers who aren’t clued up on diamonds. The choice obviously isn’t as vast with their jewelry being a department as opposed to a dedicated site. Nevertheless there is a decent selection of engagement rings available. There are engagement 56 rings in total to choose from in the engagement ring section and a further 77 in the engagement rings collections section. You also have the option of choosing your own stone but the setting is selected for you. This doesn’t sit well with me either as the setting is extremely important and here there is no choice of metal, you get what you are given. There is little or no choice of sizes available with Costco rings either. Every ring comes in a size 7 and a few have one or 2 sizes either side of this. It states that the rings can be re-sized by one size either way but Costco do not deliver this service. Anyone with an idea of the preset ring they are looking for, are shopping for someone with a size 6,7 or 8 finger and want a super quick shopping experience will probably welcome this reduced choice. However, as we showed above, shop around before you buy as chances are you will find cheaper elsewhere. There is nothing at all on the site about the ring packaging so another trip to Google was required. There was absolutely no info there either. I am sorry that I can give you no information on this whatsoever. The box you get your ring in is so important when it comes to that big, down on one knee moment. All I can recommend, if you decide to shop from Costco, is to go to a store and ask to see their boxes or make a mental note to track down a good box depending on what arrives. It takes a bit of time to track down the returns policy for their jewelry as they have several depending on whether you have purchased a ring or a washing machine. However, we the discovered a returns/warranty section underneath each piece. This looks pretty straightforward but there is no mention at all of how long you have to return your item. Although the standard is 30 days we recommend you find out for definite by calling a store. Costco are a terrific store but have a pretty poor jewelry store. Their 2 stars are for the imagery and the shopping experience. The choice of rings is okay but not being able to choose your own settings when you select a diamond and the serious lack of official certification is not acceptable. Before I started this review I expected Costco to score highly in the price department but as our comparisons show they have failed in this area as well. On the whole I would still go to Costco for my TV or lounge furniture but will stick to bespoke retailers like Whiteflash and James Allen for my diamonds.